The AgilePulse® MAX is a NEW large volume transfection system ideal for fast, efficient transfection of 2 to 6 ml of cell suspension. Specifically engineered for large-volume applications, this system maximizes cellular uptake with minimal heating and short cycle-time to ensure high cell viability in further cell processing. AgilePulse® MAX technology offers direct scale up from cuvettes to a large volume chamber; ideal for gene or drug delivery, cancer immunotherapy and protein therapeutics applications. 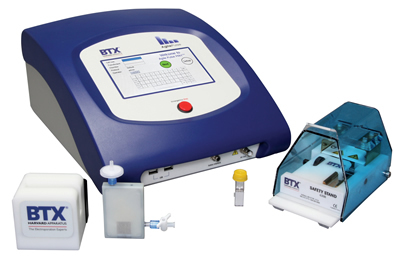 To learn more about this exciting new technology or other BTX electroporation or electrofusion products, please contact us.